"41MR12, Burial I, 65" by Timothy K. Perttula and Robert Z. Selden Jr.
DECORATION: Engraved spirals or scrolls and hooked arms that are repeated four times on the vessel body. 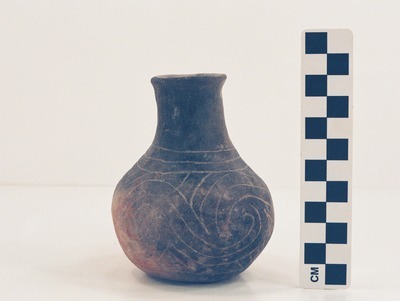 There are hatched zones both above and below the spirals or scrolls, and these are pendant from sets of horizontal engraved lines that encircle the top (3 lines) and bottom (2 lines) of the vessel body. Taylor Engraved bottle (MR12-65) from Burial I at the Ben McKinney site.